Those that use iTunes for their music library needs will know that it is easy to slip in a song that may already be there. Although this might not be an immediate emergency, it can in the long run dramatically cause clutter and chaos. Luckily there are several methods available for tracking down duplicates, making your iTunes library clean again. Choose which library you want to search for duplicates. Whether it is the entire library or just a particular playlist, select it. Select File > Display Duplicates. ITunes will automatically reduce the selected list of songs to what it thinks are duplicates. You can either go ahead and select the songs that are indeed duplicates or chose to select the songs by date of entry. To do so select the ‘Date Added’ Category column. If the ‘Date Added’ column, or any other column for that matter, is not available you can add it by right-clicking the top bar and select to add the ‘Date Added’ to your selection of sorting categories. ‘Date Added’ is particularly useful in the case of an album being added that already existed and might have a different bitrate. When song names are identical it is useful to group the songs of a certain album together by the date they were added to the library. This should be the part where I recommend some freeware on Mac for removing duplicates on iTunes. However, strictly speaking there is no freeware available for this purpose. Nevertheless, there is (paid or free-to-try) software available on mac that can help you get the job done. As removing duplicates should only be a once in a while procedure, a free-to-try option can get you a long way for free. Rinse for Mac is software that can automatically perform certain maintenance tasks on your iTunes library. Not only can it find duplicates, it can also fix bad song information, add album art or organize genres. The trial period will only let you fix 50 songs however. The software is $39 to purchase. 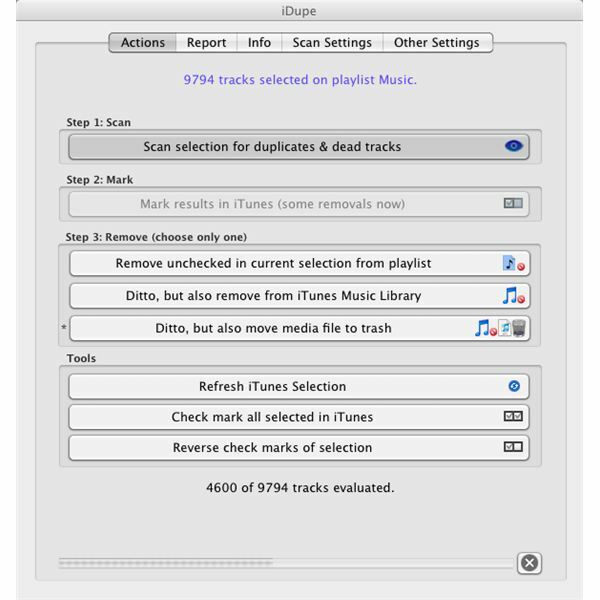 IDupe has only one task and it is removing duplicates from your iTunes library. The application is considerably cheaper at $8 and will do a fantastic job at finding duplicates. A free trial version is available, which will evaluate your library. IDupe is probably the best option at the moment for finding duplicates in your iTunes library and is relatively inexpensive. It may seem redundant to pay for software when iTunes by itself can find duplicates. Frankly, the built-in feature is not nearly as good as the paid alternatives and will use only few parameters for analyzing the library. Rinse and especially iDupe will do a much more thorough search and will come up with considerably better result. Depending on the size and the state of your library the choice is yours, but if the situation is really bad it might be worth to consider one of these alternatives. Note. Did you find any good freeware that can clean iTunes from duplicates on Mac? Share it in the comment section!